Rebecca Minkoff Embellished Leather Moto Jacket - Take 2! Decided to have another go with my Rebecca Minkoff embellished leather moto jacket and penny booties. Until I find the perfect combo I will keep experimenting with these beauties. I noticed some pink trees starting to bloom so I hunted one down near my parents house when we visited for Purim, and had little miss Ella snap some shots to share my latest spring bargainista look. While I didn't dress up for Purim, my kids did. I used to hoard cheap Gymboree and have costumes stockpiled in every size. This year my oldest was a Fireman at night and a werewolf for day. I gave him sunglasses and my UGGs (yes, my 10 year old has giant feet) and told him he was teenwolf. My middle was a cheerleader at night and 50s girl by day. My youngest, who is a giant ham, dressed up as a fairy by night and a strawberry fairy for daytime. My local nieces and nephew came by to take pics - they were all dressed as animals. You can see my BIL - the pig (my husband's identical twin) in the back. My son thought it would be funny if he ate my niece, the panda bear. She's actually wearing a Milly Mini skirt I picked up for her for $15 at Nordstrom Rack. Last but not least, I'm on a winning streak! 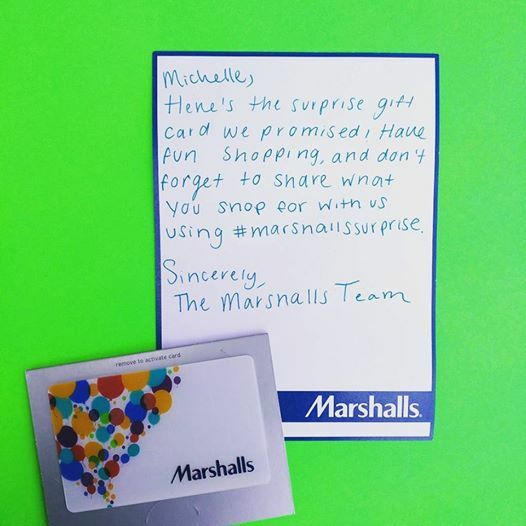 I won a $50 Marshalls giftcard for this pic on Instagram and I just won another Insta contest on Friday! Fingers crossed my luck keeps going! BTW, Happy Easter to all my friends celebrating! OBSESSED WITH THIS PERFECT JACKET. It looks sooo good on you. PS - you have perfect skin and it is amazing. Yessss love your outfit and wish my skin was so good without makeup! Also your kids on purim are too cute! Thanks D! I wish I could find more pieces to wear it with. If it was black I'd be in it every day LOL. Thanks May! I've been driving around looking for more cherry blossom trees in my hood to shoot with LOL. Love that moto over your flowy floral dress! So pretty! Oh my gosh! That dress! I love it! Thanks - it's hands down my favorite dress of last year - and that says a lot because I own so much LOL.